No amount of laughter from the back of the boat could muffle the screams in my heart. 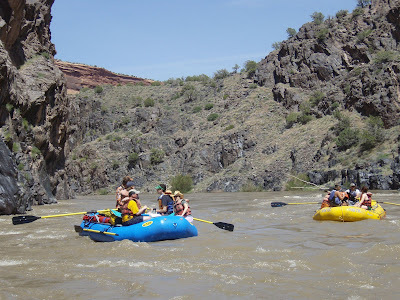 They burst from my chest, 190 howling beats per minute, pressing every cell in my body against the relentless rush of the Colorado River at flood stage. My ears, however, could only hear the primal roar of an explosion of rapids. The canyon was closing in like a funnel. Water as black as the sheer cliffs burst into torrents as white as the sun-blinded sky. They crashed against the rocks, building mountains of whitewater surrounded by a vortex of whirlpools. "That's it," said Hansel, the oarsman. "That's Skull." I glanced back at him. His face betrayed no emotion. I gripped a strap with icy fingers and held my other hand against my chest, grabbing for breaths as hyperventilation set in. My body stiffened and I felt helpless to turn away from the roiling mass in front of me. I faced it with a conviction that, despite everything I do with my life, remains a rare one - the honest conviction that I was about to die. Everybody who knows me - or who has read my book - knows that I am deeply afraid of moving water. Large waves ... the ocean ... fast-flowing rivers. But right at the top of my list is whitewater rapids. It started in childhood and culminated with a couple bad whitewater rafting experiences in my early 20s. 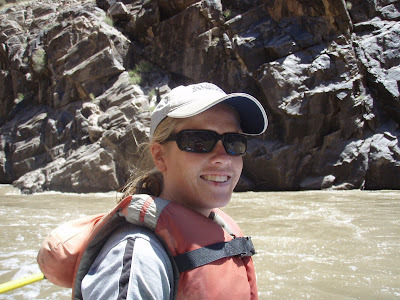 Since then, I have either completely avoided or reluctantly embarked on - with much stress - any kind of rafting, canoeing or boating experience. 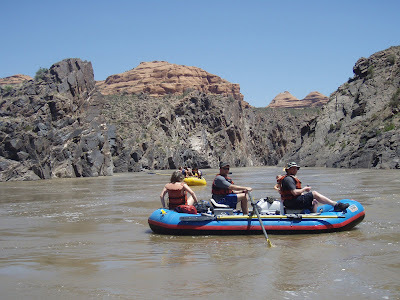 It's been hard, too, because rafting is something most of my friends in Utah love to do. 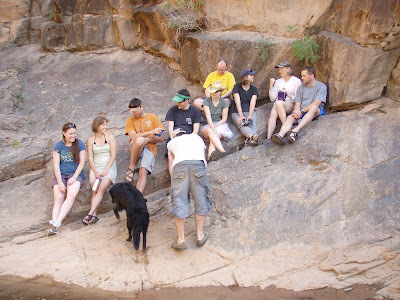 They had planned a Westwater Canyon trip for our annual spring gathering of college friends. I have been telling them since March that I wasn't going to go. But then everything started to change. Geoff went back to Juneau. I decided I wanted to be with my friends. And, after all, a little fear training could probably do me some good. I forget that most people see whitewater rafting trips as fun. 13 of us launched on Saturday morning, and it grew into quite the party trip. We camped at a spot just above the big rapids. 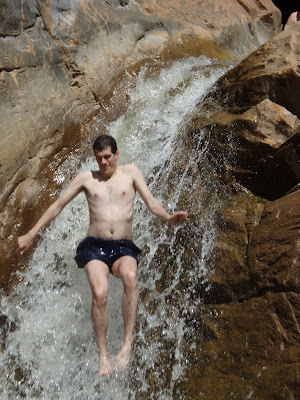 We hiked to a small waterfall, and the brave among us (not me) slid down it like a waterslide. I tried to relax but had a difficult time. Despite everything that had happened to me in the past week ... big solo bike trip, serious dehydration at 90 degrees in the shadeless desert, making the final split with Geoff ... I couldn't shake the feeling that the chocolate-milk-colored water rushing down the canyon was the ultimate doom. The group was fun though, even if my "fear training" did bring more jokes than sympathy. These are friends I only see once a year. I guess it doesn't have to be that way since I'm technically living in Utah right now. But the spring trip still has the flavor of a reunion. We continued downriver late Sunday morning, and hit the heart of the rapids very, very fast. The river was flowing near peak levles, which means big water in some spots but washed-out rapids in most. So in the view of the oarsmen, the Colorado River was flowing at an easy stage. But Skull Rapid was enormous. The last time I floated through Skull - in 2002, at a flow 15 times lower than what it was at on Sunday - I was under water. During that trip, Geoff flipped his boat at the top of the rapid and those of us on his boat - four people and a pit bull puppy - had to ride it out alone. I still remember popping out of the water just as my helpless body was heading full-bore at a sheer wall that rafters call the "Rock of Shock." Right next to me was that little puppy, shrieking. The sound remains embedded in my memory as the voice of primal fear. I was convinced I could still hear it seven years later as we barreled through Skull - despite the high water, with hardly a splash. By the time the waves finally calmed down and reality set in - that it was a perfectly smooth run and the danger was minimal - tears were streaming down my face. I wasn't crying because I was happy to be alive. I was crying because I was angry about my fear. And that made me angry about all the misplaced joys in life that, no matter how hard I try, I may never be able to reclaim. Westwater was a good trip for me - but not in the ways that I had hoped. I am still terrified of moving water, terrified to the point of panic. That was a disappointing discovery because after everything that's happened to me since 2002, I had hoped the anxiety would be lessened. That maybe I could become like my friends in the back of the boat, cheering and having fun. 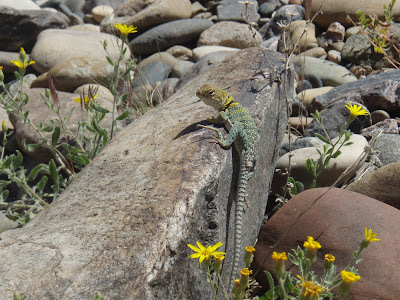 But Westwater did remind me that everything I am most afraid of can still be done - if I just learn to embrace my fear. "Everything I am afraid of can be done-if I just learn to embrace my fear." How very true that is. I have the very same fear, and have the same angry, tearful reaction each time I put myself squarely in front of my fear. My self prescribed treatment of desensitization hasn't worked so far, but I've only been doing this therapy for 10 years. My fear includes ALL open water. Put me in a swimming pool, and I'm a dolphin. Any other body of water, and I'm a quivering mass of jelly. I have no idea why - no history of near death experiences, just an inate fear. As the years pass, and my fear does not abate, I'm beginning to believe there are some life skills I just don't need to survive. White water rafting may well be one of those! I too am afraid of water, in a sense -- my fear is of murky water, so lakes are probably actually the most frightening for me. To get over this fear in the ocean, I tried to learn how to surf. Keeping myself busy and focused on something else kind of helped -- but those big fears might never be conquerable, just manageable. It's interesting how people go back and try to overcome it, though -- says something about the human spirit. did the puppy make it? I remember vividly the "room of doom" on that run. Both you and my wife have similiar feelings concerning white water. I'm missing Utah again after reading you blog Jill...Keep it up! I don't know. Maybe. Sometimes fear knows what it is talking about. Like with roller coasters and water moccasins. if you don't like being near water! I second the question above, did the Puppy make it? The puppy made it out just fine ... I'm pretty he was pulled into the second boat before I was. But, judging on that poor dog's reaction to the rest of the Westwater rapids, I think he was more traumatized than I was.